All exams are administered on a walk-in basis; however, please note that office hours vary by campus location. High school or other college partnership programs may arrange for on-site administration of the NOVA College Placement Test for prospective students who are involved in campus-related or high school outreach programs. All tests require a current photo ID and a Student ID number. Acceptable forms of ID include driver's license, NOVACard, passport, personal ID from the DMV, military ID or green card. NOVA Online exams require a test pass. Learn More about testing center procedures. English, Math or ESL/Accuplacer Placement Tests must be started 2 hours prior to closing. NOVA Online and all other exams must be started 60 minutes prior to closing. All exams are collected 15 minutes prior to closing times. Hours may vary each month for holidays and special closings. Click the button below. Need to take a placement test or make up a course exam? Contact your campus Testing Center. NOTE: All of NOVA’s six campuses administer Extended Learning Institute (NOVA Online) exams, but the Reston Center does not. NOVA testing centers are located on each campus. You can take placement tests at any campus location. If you are enrolled in NOVA Online distance learning courses, you may take your examinations at any NVCC testing center location. However, students enrolled in campus-based distance courses may take exams only on that campus. Be sure to check with your instructor for specific information regarding examinations in your course. How do I take Placement Tests to enroll in a Math or English course? How do I take the exams for my online learning course? How do I secure an exam proctor if I'm outside the area? How do I find an Exam Pass to take my ELI exams? Registration for ENG 111, MTH 120, MTH 126, MTH 151, MTH 163, MTH 166, MTH 173 and MTH 271 requires placement testing. You may take the English and Math Placement exams at any campus testing center after you have been admitted to the college. If you are enrolled in an NOVA Online online learning course and cannot travel to a NOVA campus testing center because you are located outside the Northern Virginia/Washington, DC Metropolitan area, you may request to have your exams proctored at another college or university testing center. Active duty and deployed military personnel may submit a proctor request for an approved military educational or test control officer. All other students must take their exams at a college or university testing center. Exceptions are only granted for documented mitigating circumstances, not based on student preference. You are responsible for your own transportation, childcare, and work schedule adjustments. NOVA Online requires that students use a college or university testing center for all exams. Students should contact the intended testing facility to discuss proctoring requirements and costs. It is your responsibility to secure a proctor and to pay any fees charged by the proctor. Requests for proctored exams taken outside of a college or university testing center are only granted for documented mitigating circumstances. Individual proctors will not be approved based on student preference. Requests for proctored exams and proctors must be approved by NOVA Online. NOVA Online reserves the right to reject requests for proctors for any reason. Qualified Proctors: A testing center at an accredited college or university. Active duty and deployed military personnel may submit a proctor request for an approved military educational or test control officer. Students needing an accommodation based on a disability should contact NOVA Online for help in identifying an appropriate proctor. In documented mitigating circumstances, a full-time faculty member at an accredited college or university may be eligible, provided we can verify their employment status and the exams are taken at a college or university office with a computer provided by the test proctor. Proctors cannot be a family member, employer, friend, co-worker, or someone with whom the student has any personal relationship. Proctors also cannot be an adjunct faculty member, teaching assistant, athletic coach, or student worker. **Students requesting a testing accommodation must have a memorandum on file with NOVA’s Office of Disability Services, prior to taking exams. Accommodations are not retroactive and will not be granted without following the process as outlined by NOVA’s Office of Disability Services. Accommodations must relate to online courses. Complete the NOVA Online Proctor Request Form and submit it with your proctor's statement on letterhead to NOVA Online (see the Proctor Request Form for details). Please note on the form that you are requesting to take the English or Math Placement Exam. Proctor requests may take up to 5 business days to process. All students will receive an email confirmation when the exams have been sent to the proctor. All proctor requests must be verified. Delays in submitting your request and delays in response to the verification process with your proctor may result in missed exams and grade penalties. DO NOT wait until the last minute to submit proctor requests. Northern Virginia/Washington DC Metropolitan area residents: you are required to take your exam at a NOVA testing center or to use our online proctoring service, ProctorU, if it is available in your course. Check the availability of this service in your course under Exams. Students in other states: You may take your exams at a college/university testing center near you (submit a proctor request for approval. See below: How do I secure an exam proctor? ), or via our online proctoring service, ProctorU, if it is available in your course. Check the availability of this service in your course under Exams. Print an NOVA Online Exam Pass to take with you to the testing center. NOVA Online Exam Passes are obtained from your course Syllabus or printed from the NOVA Online Website at http://eli.nvcc.edu/courses.htm and then select the Semester, Subject, and the Course. • You will not be allowed to take an exam without an exam pass, and students cannot print exam passes at the Testing Center. Each NOVA testing center has different hours and different holiday or other closings. We strongly recommend that you visit the website of the testing center you wish to visit to check its hours before you go there for a test. You should also be aware that occasionally, unforeseen events like power failures or flooding require a testing center to close unexpectedly. If you have questions about the posted hours, you may call the testing center to verify that they are open. Finally, please remember that NOVA Online exams must be started at least 60 minutes before closing time, and all exams are stopped and collected 15 minutes prior to closing. • NovaConnect ID (also called your Student Number or EmplID). Look up your NovaConnect ID before you go to the testing center and note the number on your Exam Pass. 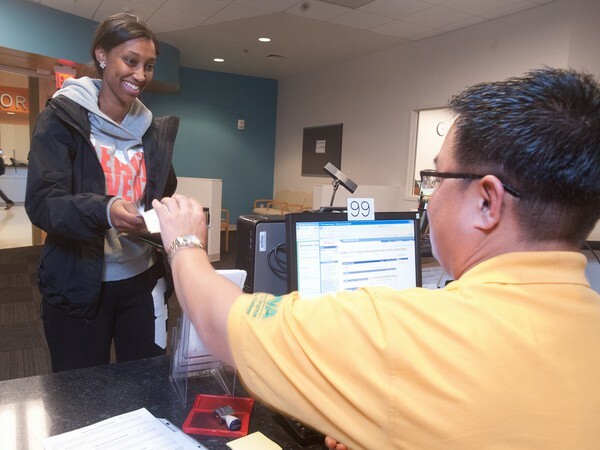 Go to an NVCC campus testing center and present the Exam Pass for the exam you will be taking. • There are six NVCC campus testing centers (Manassas, Woodbridge, Springfield, Annandale, Alexandria and Loudon) You cannot test at the Arlington or Reston Centers. • Children are not allowed in the testing centers. • Students are responsible for their own transportation, childcare, and work schedule adjustments. Your instructor will receive the exam and provide feedback at a later date. Important: Students taking tests requiring extensive calculations, such as math, chemistry and engineering, and exams with essays should allow two to three hours to complete these exams. Once a test is given to a student it is considered taken whether finished or not. Important: Only one test will be administered at a time. Students requiring multiple tests must go to the end of the line after each test. Students taking online courses at NOVA who reside outside the Northern Virginia/Washington, DC metropolitan area are required to take proctored exams either at another college or university testing center, or through our online proctoring service, ProctorU, if it is available in your course. If you choose a college/university near you to test, please submit the proctor request form for approval. If you reside in the Northern Virginia/Washington, DC metropolitan area, you are required to take your proctored exams at one of NOVA’s testing centers, or to use our online proctoring service, ProctorU, if it is available in your course. You do not need to submit a proctor request. Active duty and deployed service members may request proctoring through a military education or test control officer. Students needing an accommodation based on a disability that prevents them from traveling to a college testing center should contact NOVA Online for help in identifying an appropriate proctor. Students with documented mitigating circumstances may request an individual proctor, subject to NOVA Online verification and approval. Proctors will not be approved based solely on student preference. NOVA Online reserves the right to reject requests or proctors for any reason. *Students are responsible for transportation, childcare, and work schedule adjustments needed to meet exam deadlines. Students are also responsible for any costs associated with proctoring services. How long does proctor approval take? Please allow up to 5 business days for processing of a proctor request. All proctor requests must be verified. Delays in submitting your request and delays in response to the verification process with your proctor may result in missed exams and grade penalties. If you have questions, or to check the status of a request, call (703) 323-3347 or 1-888-435-6822 or email elicoursespecialists@nvcc.edu. Where should I take my exam? Northern Virginia/Washington DC metropolitan area residents: you are required to take your exam at a NOVA testing center or to use our online proctoring service, ProctorU, if it is available in your course. Other Virginia residents: You may take your exams at any Virginia Community College testing center, via our online proctoring service, ProctorU, if it is available in your course, or at the testing center of another Virginia college/university at which you are a student (submit a proctor request for approval). Use the College Locator feature on the Virginia Community College System (VCCS) website to find a college near you. http://www.vccs.edu/. Students in other states: You may take your exams at a college/university testing center near you (submit a proctor request for approval) or via our online proctoring service, ProctorU, if it is available in your course. Must be a testing center at an accredited college or university. In documented mitigating circumstances, a full-time faculty member at an accredited college or university may be eligible, provided we can verify their employment status and exams are taken at a college or university office with a computer provided by the test proctor. Active Duty and deployed military personnel may submit a proctor request for an approved military educational or test control officer. Proctors cannot be a family member, employer, friend, co-worker, or someone with whom the student has any personal relationship. Proctors also cannot be an adjunct faculty member, teaching assistant, athletic coach, or student worker. Exams may not be proctored at the home of the student or proctor, or using a personal computer provided by the student. Students needing an accommodation based on a disability should contact NOVA Online for help in identifying an appropriate proctor. **Students requesting a testing accommodation must have a memorandum on file with the NOVA Office of Disability Services prior to taking exams. Accommodations are not retroactive and will not be granted without following the process as outlined by the NOVA Office of Disability Services. Accommodations must relate to online courses. **Students who are temporarily bedridden due to illness or injury may provide a doctor’s note directly to NOVA Online to discuss appropriate proctor accommodations. If you have a Virginia address and are requesting a proctor outside of Virginia or the United States, you will be subject to address verification and domicile review. Also, any student requesting an exam to be sent to a different region, state, or country that does not align with the address listed in the student information system will be subject to address verification and must provide documentation to support their request. For all approved requests, exams will be emailed or mailed to the proctor and students will receive an email confirmation at their student email address (@email.vccs.edu). NOVA Online Exam Passes are obtained from your course Syllabus or printed from the NOVA Online Website at http://eli.nvcc.edu/courses.htm and then select the Semester, Subject, and the Course. You will not be allowed to take an NOVA Online exam without an exam pass, and students cannot print exam passes at the Testing Center. If your course allows open-book exams, you will not be able to use your electronic text, printouts of the electronic text or copies of the pages of a hardback textbook during the exam. If you will want to use your book on these open-book exams, you should opt to buy a physical book rather than an eBook. Unlike a hardback textbook, eBooks cannot be returned. Access to an eBook may expire after a period of time. If you need the text for a second semester or get an extension to complete the course, you need to make sure you have enough time to complete the course(s). Some publishers block printing from electronic textbooks. Some publishers block the use of screen readers when accessing the electronic textbooks. To determine what restrictions the publisher has placed on the eBook you are considering purchasing, after you have searched for the book in the Digital Textbooks site, click the book title and then click “eContent Details” on the NOVA Online Bookstore website.